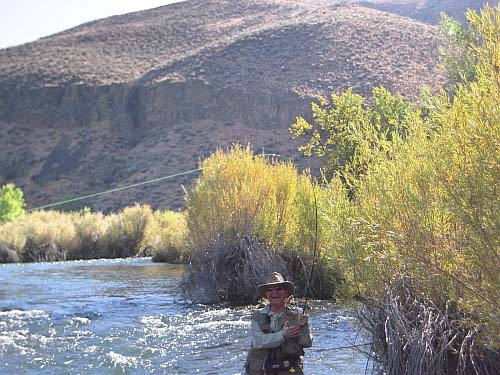 Last October Steve Cooper came around and made a presentation on fishing the Owyhee River on the far eastern side of Oregon. He offered us the opportunity to come up there to a fishing campout that he would put on, providing us with meals and some guiding for an attractive rate. The topic of going for this came up during last year's Klamath Fishout. Co-conspirators were myself, Mike Pinelli and his son Andy from Portland, and Homer Eaton. Various others expressed interest at one time or another, but life happenings got in the way, and it stayed just us four with a last minute addition of a friend of Homer's. It's a looong way out and up to the Owyhee. 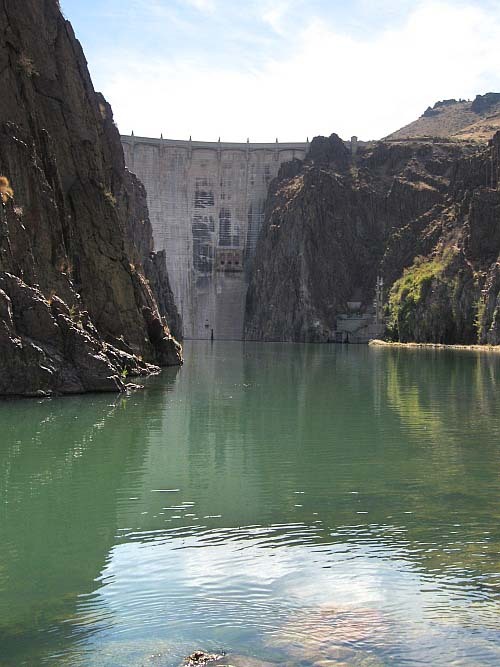 The preferred route from the Bay Area is to take a day to get to Winnemucca, halfway across Nevada, and then half of the next day heading north to the Owyhee. Homer and I arrived, located Steve and his camp. 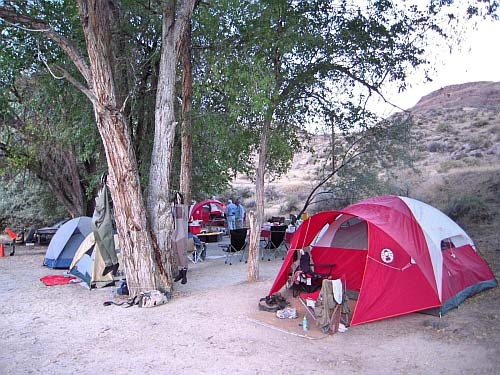 We had been expecting to set up out own tents and sleep on the ground, but Steve provided us with comfortable big tents with cots and mattress pads. 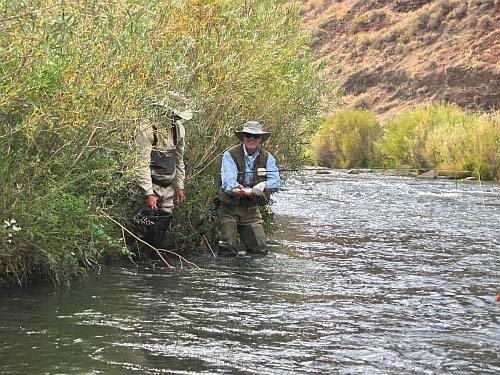 We started in fishing, but didn't do much good until we got some coaching from Steve on the style of presentation and the flies the big browns of the Owyhee would eat. Pretty soon we were all catching fish. 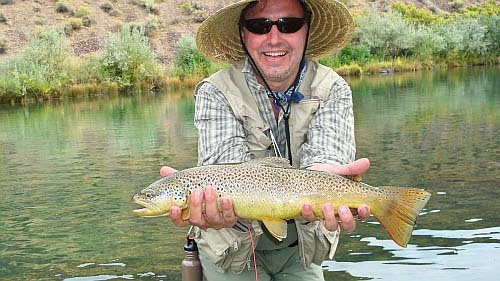 The flies that worked were all fairly small, not surprising for September--size 16 and smaller. Midges were quite effective as were micro mayflies. The main identifiabale hatch were callibaeiitis mayflies. This tended ot happened early to mid-afternoon. 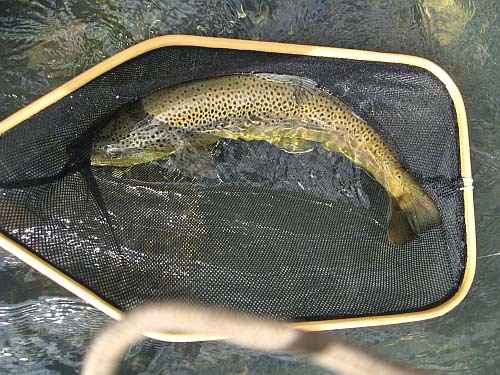 Emergers like Overly's Spotlight Emerger and dries like Parachute Adams were effective. Once we got in the groove with the flies and the technique, we had good fishing all three and a half days we were there. Steve not only guided us, but provided three great meals a day--all this for $75 a day per person.